A total of 35 candidates are in the fray for the five Lok Sabha seats including 30 male and five female candidates. Similarly, 244 candidates are contesting for the 35 Assembly seats -- of which 219 are male and 25 female. 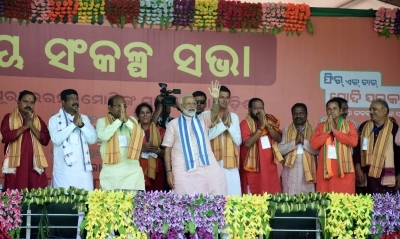 Several political heavyweights including BJD Rajya Sabha members Prasanna Acharya and Achyut Samanta, sitting Lok Sabha member from BJD Kalikesh Narayan Singhdeo, BJP National Secretary Suresh Pujari, former MP Sangeeta Singhdeo are contesting the Lok Sabha polls in the second phase. Besides, senior Congress leader and opposition leader Narasingh Mishra is fighting from Bolangir Assembly segment while BJP legislature party leader K.V. Singhdeo is contesting from Patnagarh Assembly seat. Re-polling will be held in two polling stations following reports of glitches in Electronic Voting Machines (EVMs) during the first phase of polling on April 11.